It was one of those days when we were wandering round the villages, heading north to the village of Straja, looking to spend the day with traditional artisans and learn the art of barrel making. There are amazing views in Bucovina, mountains with very tall trees, but there is one more thing that we consider a real tourist attraction: the old crafts in a Romanian village setting. As the old Romanian saying goes, “The man blesses the place”. This place is blessed with some wonderful people, with beautiful souls, and, some of them, are living links to the past. People like Popescu Gheorghe, son of Ioan, born in 1924, the last cooper (barrel maker) in the village of Straja. He is still mourning the loss of North Bucovina in WW2, when the North became an Ukrainian territory. “I used to lead my cattle on those pastures”, he says with certain nostalgia, while pointing at the mountain which now belongs to Ukraine. As a carpenter, he learned barrel making all by himself. And still has a lot of energy to put into his old crafts. He is making butter churns (untarniță), primitive wooden cheese, yogurt jugs (barbânță) and primitive wooden tankards. They were used by peasants for storing cheese, yogurt, milk. When working in the field, on a hot day, the meal would stay fresh and cool in a tankard. At a brief look on Google you don’t find many of these items on the market, and many of them found their place in museums. Another lovely detail about his craft is that he uses wooden hoops, not metal ones. 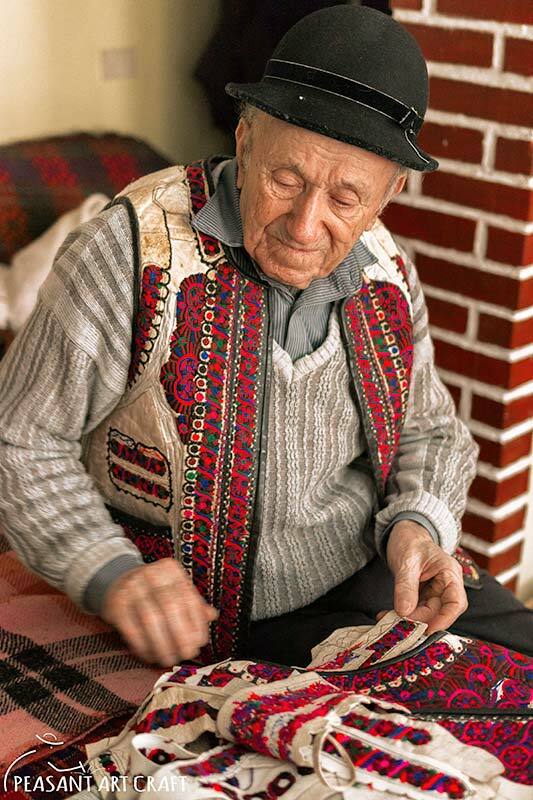 He is among the last traditional artisans in the world still making such authentic items! There is no difference between his craft and the ones you can find in museums. And I’m not sure how many people on Earth (if any) are still creating such things. Yes, this man is a treasure. We tried to catch the basics of his craft and as much as I understood, these items have similar crafting principles. He uses spruce wood staves, elm, cherry or ash wood hoops and beech wood covers. He chops the staves with a special hollowing knife and a mallet. He coaxes the wooden staves on a drawbench. To bond with the other staves, they must be accurately made and measured. Then, they are assembled inside two metal hoops. Then, the wood artisan replaces these metal hoops with wooden hoops. The craft of these hoops take some additional stages. He cuts the wooden boards with a circular saw, boils them and bends them by hand. The edges are perfectly joined into a circle. The covers also take some time and precision, to ensure they fit. They are cut with a handsaw, then carved with a chisel. As you might have guessed, the whole thing takes some time. He finishes a tankard in 2 days, and a butter churn in 4 days. Exclusively by hand. We could not leave without buying a tankard for us. Later we filled it with fresh kneaded cheese from a sheepfold and after two months of being in the refrigerator, the cheese was excellent! Moreover, it changed it’s taste and consistency into something very similar to the Parmesan cheese. If you have one, just keep it away from the sunlight. If you want to store liquids, like milk, and it drips, this trick will do: fill it with water and add some corn flour. Leave it a day or two. The corn will fit in and cover the empty spaces.